Permits can also be obtained online. Go to the Fire Permit page for more information. 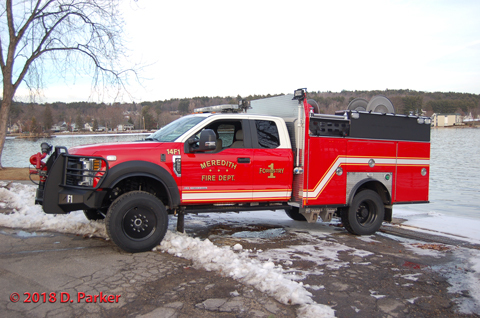 The Meredith Fire Department took delivery today of the new 14 Forestry 1. The apparatus was manufactured by Spencer Fire Trucks of South Haven Michigan. The purchase was made possible with an award from the Federal Assistance to Firefighters Grants program. The truck features a 500 GPM pump, 300 gallon water tank, a Foam Pro foam system with a 20 gallon tank, and pump-and-roll capability. There is also a front-mounted water nozzle that can be controlled from the cab by the vehicle operator. Members have begun training on the new piece and it is expected that the truck will be in service within the next couple of weeks. Meredith companies were alerted at 20:21 to structure fire at 8 Water Street. Initial information from several callers to the LRMFA Communications Center stated fire was showing from the building. 14C1 (Jones) arrived on scene at 20:25 and reported heavy fire throughout the 2nd floor of 40' x 60' 2½ story dwelling, with exposure hazards and requested a 2nd alarm. He also indicated that all building occupants had evacuated the structure. 14 Engine 1 arrived shortly after and the crew deployed a 2½" hand line and began an exterior attack to knock down the fire, then transitioned to an interior attack, making a push to the 2nd floor to continue knocking down the fire. 14 Tower 1 arrived on scene and was deployed on the "B" side of the building in a parking lot adjacent to the fire building to gain access to the roof. At 20:57, Incident Command advised that the bulk of the fire had been knocked down and was holding all companies to begin extensive overhaul operations. The 2nd alarm brought Laconia, Center Harbor, Moultonborough, Holderness, Gilford, Ashland, New Hampton, Bristol, Sandwich, and Plymouth to the scene. Belmont and Sanbornton covered both Meredith stations. One firefighter suffered a minor knee injury and was transported to the hospital for treatment and released. Mutual aid companies had all been released by 23:00. All Meredith companies had returned to service by 00:56 on December 1. Meredith personnel assisted New Hampton and Ashland companies at a vehicle accident with people trapped in the vehicle. At 6:54, 14 Rescue 1 was requested to Interstate 93 North at Mile Marker 71.8. An SUV had left the roadway striking trees in the median, trapping two occupants. Meredith personnel assisted with extricating both occupants. One occupant, who had been impaled through the abdomen by a small tree, was airlifted from the scene by DHART and transported to Dartmouth-Hitchcock medical Center in Lebanon. The second occupant was declared dead at the scene. 14 Rescue 1 was in service at 8:43 hours. Belmont companies were notified at 22:31 for a structure fire at 722 Province Road. The first companies arrived to a 2½ story farmhouse with an attached ell and barn that was well involved and requested a 2nd alarm. 14 Engine 4 was dispatched at 22:46 to cover Laconia Central Fire station as part of the 2nd alarm assignment but was diverted to the scene along with 14 Rescue 1 when command called for a 3rd alarm. 14 Engine 4 arrived on scene to heavy fire conditions and was ordered to immediately deploy a Blitzfire and additional hand lines to the A/D corner of the building to assist with fire suppression. 14 Rescue 1 provided assistance with rehab and SCBA air replenishment. The blaze eventually went to 5 alarms as temperatures fell to below zero which required additional manpower and apparatus to replace crews and equipment affected by the cold temperatures. 14 Rescue 1 was placed in service at 5:28 while 14 Engine 4 was released from the scene at 7:27 hours. Meredith companies were requested at 15:38 to assist at a 3rd alarm structure fire at 90 Pleasant Street in Franklin. 14 Engine 3 responded as part of the 3rd alarm assignment. Franklin companies were notified at 15:03 for a structure fire. Responding companies relayed to the Communications Center that a column of smoke was visible immediately after responding and requested a 1st alarm. Companies arrived at 15:14 to a large 2½ story dwelling with fire showing and immediately upgraded to a 2nd alarm. Command called for the 3rd alarm to bring additional manpower to the scene. Upon arrival, 14 Engine 3's crew assisted with salvage and overhaul..
14 Engine 3 was released from the scene at 17:32 hours. Meredith companies were alerted at 0:24 to a 2nd alarm structure fire at 84 Heritage Hill Road in Holderness. 14 Engine 4 responded to the scene. Holderness companies were notified at 0:12 for a structure fire, but based on information relayed to the Holderness chief from theLRMFA Communications Center, the incident was immediately upgraded to a second alarm. Upon arrival, 14 Engine 4 was placed into a tanker shuttle to assist with water supply and the crew was assigned to help with fire suppression and overhaul. 14 Engine 4 was released from the scene at 2:35 hours. Meredith's 14 Engine 4 was part of a 1st alarm response to a structure fire at 47 Orchard Drive in Moultonborough taday. Meredith personnel were called at 9:21. Upon arrival, Meredith personnel were assigned to openening up interior walls to check for extension around the chimney area. The fire had begun as a basement fire but had traveled up the walls into the attic area. 14 Engine 4 was placed in service at 11:03 hours. This site last overhauled on: 4/7/2019 2:13:39 PM Copyright © 2001 - 2019 David E. Parker. All Rights Reserved.